The Voice Coach Lea Salonga vent out her anger on Twitter after a live audience took to social media and shared the result of the next round. The Voice had recently finished the Blind Auditions and will start the Battle Round to be aired on December 6, 2014. It is known that The Voice of the Philippines episodes were filmed weeks before being televised in the Kapamilya Network. Blind Auditions took days to be filmed and before it was aired a live audience already knew the result. This is the same with the Battles Round where chosen artists will go head to head against artists in the same camp an the coach will have to choose whom will have to be let go. For obvious reasons, the results of each rounds must be kept secret by the live audience. Unfortunately, a live audience decided to share the results of the next round on a social media which made Lea Salonga angry. It will still take weeks before the actual live shows and Lea suggested on her post on Twitter that they should not have audience outside the network anymore. She further shared that the spoiler had ruined the experience of the viewers. On Tuesday, November 2, The Voice of the Philippines officially warned the spoilers not to share the results. I am angry. Very, very, very angry. I am proposing that we no longer have audiences invited from outside ABS-CBN because of one a******. 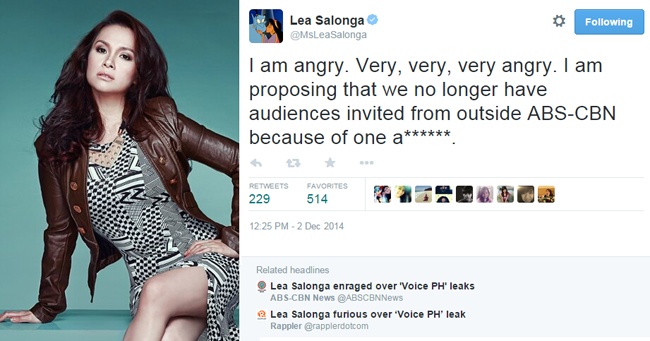 Lea soon posted on Twitter and shared that she had thought about the matter and calmed down. She believed that the show is a massive hit on TV thus, there could be spoilers. She shared that the journey of each artist in The Voice of the Philippines is about how they pour their hearts in their voices and songs. Lae also encouraged viewers to continue rooting for their bets and praised God for giving the country an abundance of wonderful singing talents. The Voice will start airing the Battle Rounds on December 6 and a coach will have to let go of some artists in each of their respective camps.